Completed STX160.0 - The most powerful ATX unit, in the world! Discussion in 'Custom Cases & Projects' started by Aibohphobia, Aug 17, 2016. Where other, lesser ATX units need you to hook up stuff like a motherboard, video card, and storage drives to it and put it all inside a case to be functional, the mighty STX160.0 is a fully operational battle station gaming computer right out of the box! Rougebot, Broxin, HDZEE and 8 others like this. 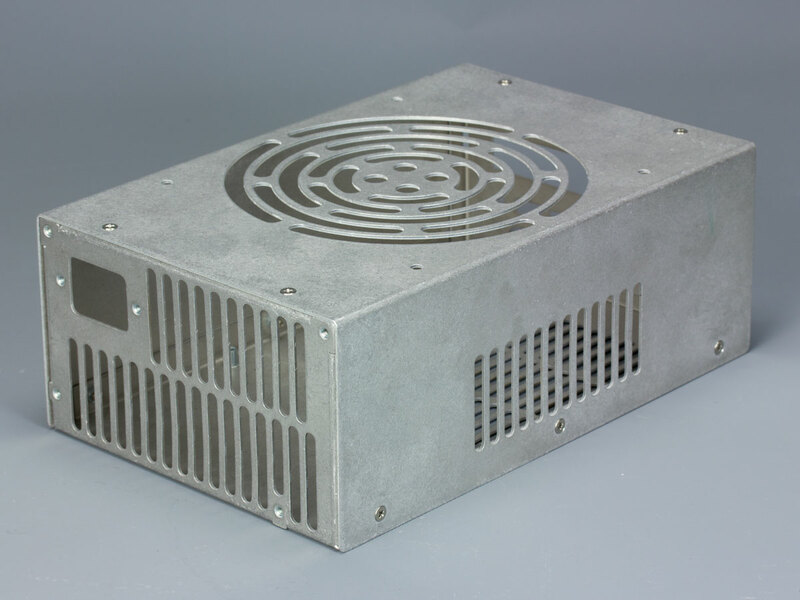 Designing the case part 4: Vent cutouts and frickin' laser beams! STX160.0 is now fully operational! Broxin, TinyAudio, LjSpike and 1 other person like this. But CES came and went with still no real indication of when we would see these boards on the market, or if they would even be available at all or just limited to OEMs. Computex didn't really improve things and I forgot about the idea. Two things that happened within the last few weeks changed things though and that old idea came back with a vengeance! First: The NVIDIA GTX 1060 launched and the mid-range Pascal card delivers GTX 980 levels of performance while only drawing 120W at full load! And the reference PCB is short to boot! Second: ASRock announced their H110M-STX board and they specifically mentioned that the M.2 is wired with PCIe 3.0 x4 to the CPU. With a 3.0 x4 connection to the processor, that meant a M.2 to x4 slot adapter should work (in theory) and it'd be possible to hook up a video card to this tiny board with minimal performance loss! A bit of research led me to the Bplus P4SM2 for the M.2 to PCIe x4 slot adapter and the HDPLEX flexible PCIe extender. The P4SM2 is a bit pricey but from what I was reading it's the only adapter proven to work reliably by people using them to add external GPUs to Intel NUCs (before doing the same over a Thunderbolt connector became feasible). The HDPLEX extender seemed good because it's not overly long, is extremely flexible, and @iFreilicht had good luck with it in his testing. Next was power, and once again I turned to HDPLEX, selecting their 160W internal AC-DC adapter to convert incoming 120V AC to DC. It puts out 19.5V DC and conveniently the H110M-STX needs 19V DC in for power (the 0.5V different shouldn't matter, it's common for laptops to have a 19V label but come with a 19.5V AC adapter). 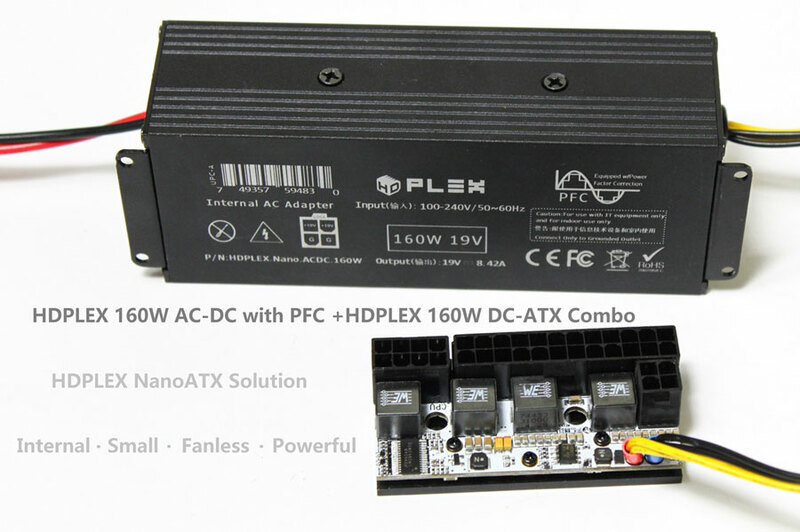 The video card needs 12V though so I'll be pairing the AC-DC adapter with the HDPLEX 160W DC-ATX unit. The ASRock doesn't have an internal power connector (just the 5.5mm x 2.5mm barrel connector on the back) and the HDPLEX 160W DC-ATX doesn't have a PEG connector so I'll have to cobble together a wire harness but otherwise it should work. 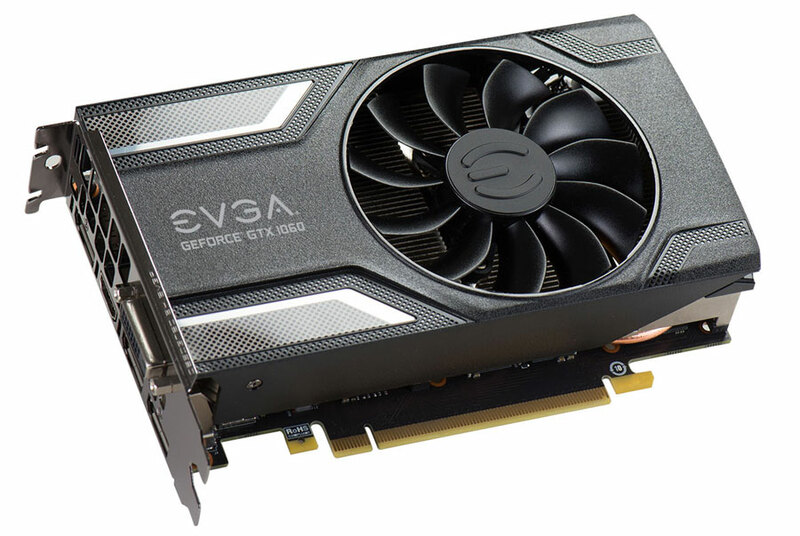 For the video card I ended up selecting the EVGA GTX 1060 SC Gaming. It's short, reference height, single 6-pin power, and with a BIOS update, semi-fanless functionality. Check, check, check, and check. Unfortunately it's been out of stock every time I've checked for the past two weeks but it's finally showed up on Amazon for pre-order with an in-stock date of August 19. I put an order in but we'll see if that date holds true. Storage I'll figure out later once I have a better idea of how much space is leftover. So that just leaves CPU and RAM. 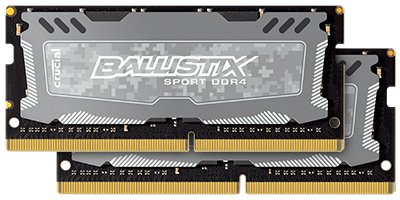 RAM is an easy choice, 2x8GB of DDR4 SODIMM. While the performance benefits of dual channel over single channel is minimal, 16GB is plenty for what I'll use this for and I don't think I'll ever upgrade it to 32GB so it makes more sense to just get two sticks. The Crucial Ballistix Sport LT looks good (in the pictures at least) so I had ordered a set of that. For the CPU, I am limited to the 35W T-series SKUs since: 160W (HDPLEX) - 120W (GTX 1060) = 40W for everything else. The HDPLEX 160W AC-DC can do 195W max but I don't want to push it since ventilation in this thing isn't going to be great. 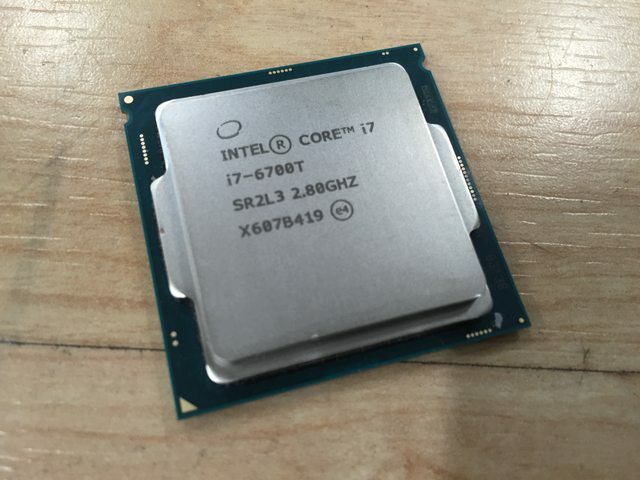 So while I would have love to have an i7 in here, even if it's the lower-clocked T-version, I just couldn't justify paying $360 for a new one. In the end I went with the i5 6400T and a kit of Kingston HyperX. Luckily both of those have passed an overnight run of Prime95 with no errors. Lesson learned though, modern RAM and CPUs are very reliable, but it still pays to test everything just to be sure. Whew, that's enough writing for tonight! Broxin, Phuncz, Soul_Est and 2 others like this. Great concept.... but will it all fit? Wow, just wow ! I wish there was STX for LGA1150. This is the tiniest of the tiny gaming systems and with the 1060 you can play anything with good settings @ 1080p. Just curious, what about the front IO? I'm seeing rear IO and a PCI cutout through the vents. But then the front side gets a C14 plug only? Or is this just the mock up you made and you are actually going with a different design? Now you just need one of those dual-PSU-capable ATX cases to install this in along with a second complete system. Soul_Est and Aibohphobia like this. I hope so! It all does in the CAD model but only with 2-3mm to spare. That'd be nice for downsizing a current system. This concept almost makes me regret buying an A4 case. I await your next steps with interest and impatience. I'm also a bit surprised that a boutique builder hasn't let something like this leak out of their skunkworks...kudos to you if you can pull it off! This might actually make a cool upgrade for people who have behemoth cases that have dual PSU mounts. This concept almost makes me regret buying an A4 case. This is just something a personal project I'm doing on the side because I think it's cool. While people may like the idea of a full gaming computer in an ATX PSU form factor, the limitations and tradeoffs are pretty big. So it's unlikely this will ever go to production. This has been technically possible for a while with a NUC. But I want the bragging rights of having a socketed CPU so that's only become possible very recently with the release of Mini-STX boards. Looking forward to this, I can't wait to see how you got this to fit inside of that very constrained box. Soul_Est and Hahutzy like this. Looks like it will be a tight fit. Good luck! talkion, Matias Petersen and Aibohphobia like this. I recognize that there are significant challenges with this design approach, but the possibilities for builds like this becoming an actual thing in not too short a time frame are exciting. It's a very strange layout for sure. I'm hoping for a pretty quick turnaround on this project. We'll see. As mentioned at the end of the intro post, after I had figured up a rough parts list I set to work mocking things up in SketchUp. I want to detail my process of going from idea to finished CAD model that's ready to manufacture so grab your beverage of choice, this will be a long post (actually posts it turns out)! The whole point of this project is to fit a complete computer within the dimensions of an ATX PSU-sized housing. So my first step was to double-check what those dimensions were. The form factors of standardized things like ATX power supplies, Mini-ITX motherboards, PCIe cards, and so forth are typically defined by long, technical spec sheets. Many of which are available from formfactors.org. Strangely they don't have the newest ATX revision v2.4, but luckily @EdZ has uploaded a copy to the Resources section since it's no longer available from Intel's site either. The physical dimensions haven't changed in many years but it's good practice to work with the latest version of a spec. Few things of note though, while it's good to adhere to the spec as much as possible to maintain compatibility, it's also necessary to be aware of how other manufacturers deviate from it in practice to make sure whatever you're designing will work in the real world. For example, the ATX spec officially only allows for a housing with a 140mm depth. 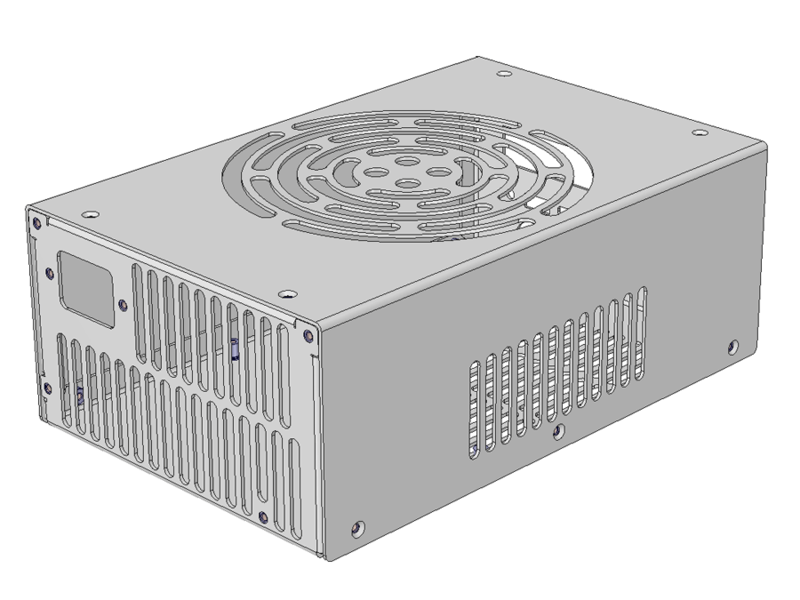 But anyone who's shopped for ATX power supplies knows that almost all the higher-end units are 160mm deep or more. 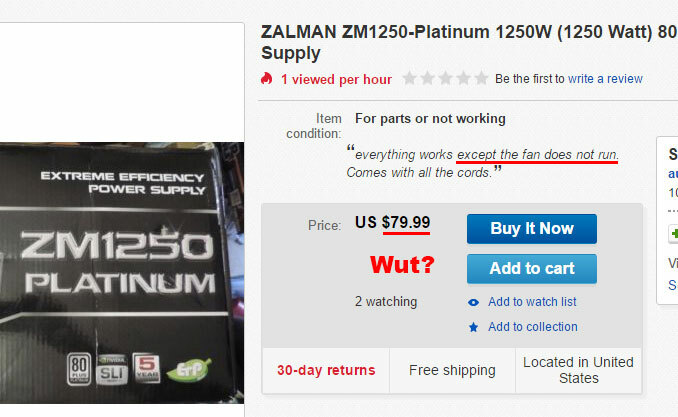 What's going on is that most enthusiast power supplies are actually using a combination of the ATX and the Entry-Level Power Supply (EPS) specs. Entry-level in the context of server PSUs BTW, it's actually meant for higher wattages than ATX and because of that it allows for much longer depths, up to 260mm I believe. 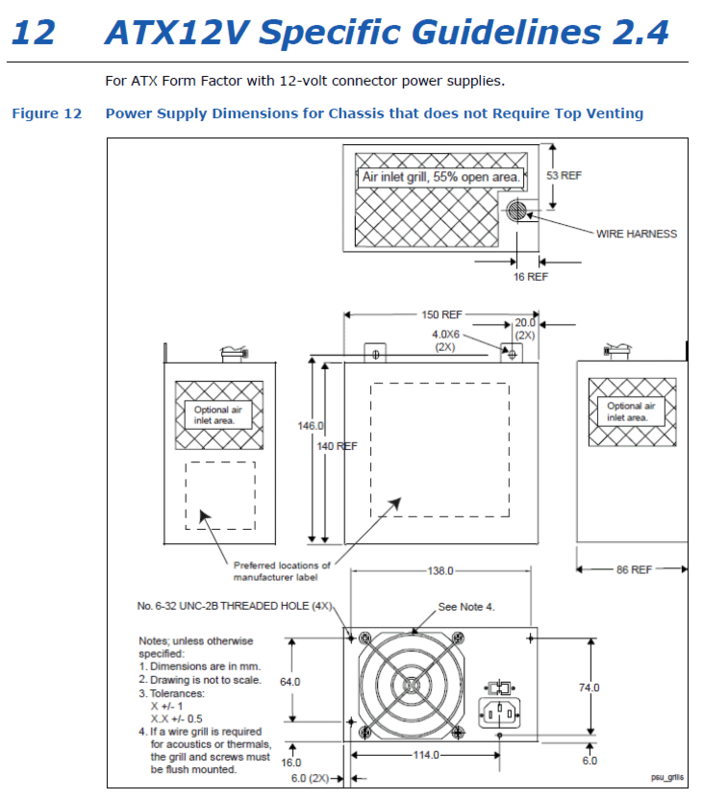 The height, width, and mounting holes are the same though so I'll just use the figure 12 from the ATX spec for reference. Another deviation is the mounting tabs visible at the front edge of the unit in the diagram. I'm not sure if it's an optional part of the spec or not, but either way, nobody ever implements it in consumer units so adding support for them in a consumer case is pointless. So with that little lesson out of the way, what are the dimensions I have to work with? Well, it's 86mm height x 150mm width x ? depth. 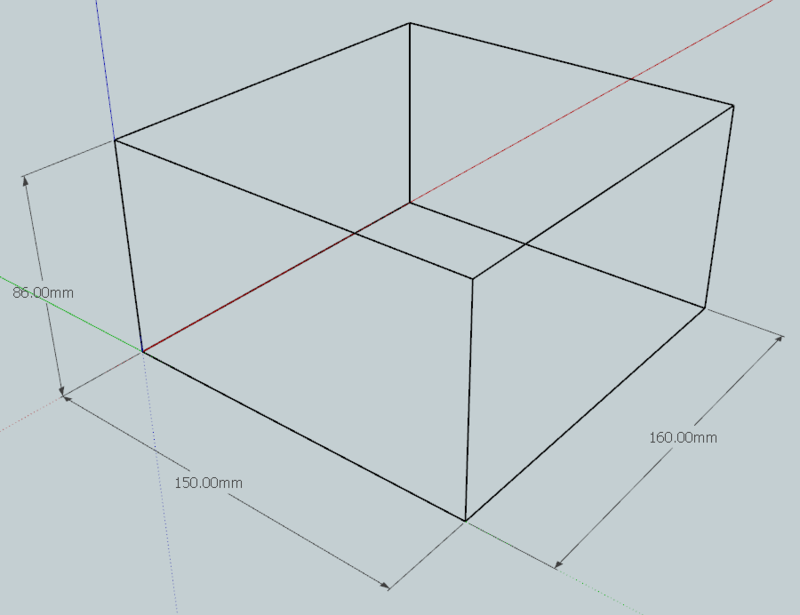 Now that I've used "real" CAD programs, I don't think that SketchUp is the best program for designing a case. 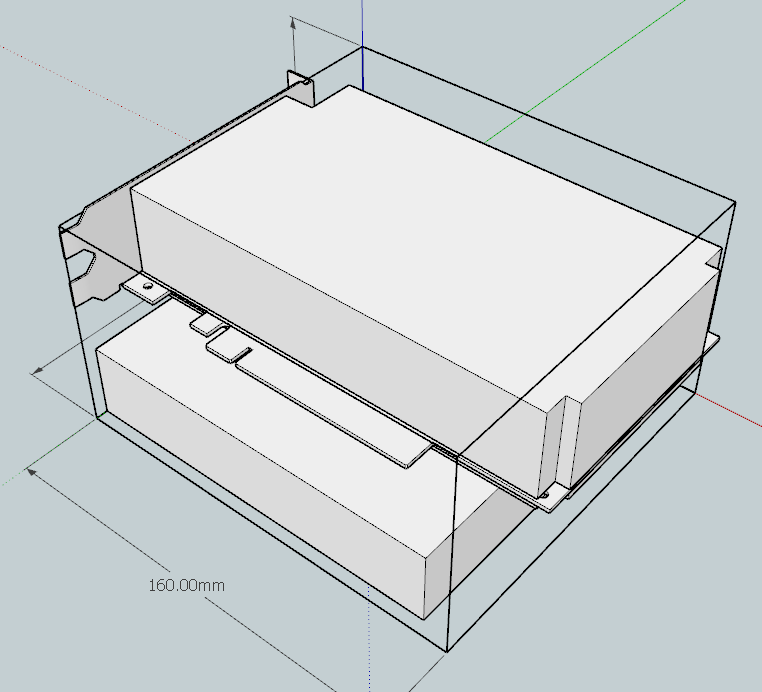 It's really meant to be used as the 3D equivalent of a paper sketch (hence the name) and while people have done really cool things with it, a proper solid modeler with sheet metal support is much, much better suited for designing a case. That's a topic for another day though. But for quickly roughing out a layout, it's the perfect tool for the job, so SketchUp is still where I usually start with a case design. Here I've made a simple wireframe outlining my starting dimensions. The height and width are locked in but the 160mm depth is just a starting point until I get mockups of the parts in there and starting figuring out how much room I'll need. Next I dropped in a very rough placeholder for the Mini-STX board and a PCIe video card from subtec's excellent precise blank model, modified to the length of the EVGA GTX 1060. And duh, a video card that's at least 172mm long won't fit in a case that's only 160mm deep At this point I was still thinking I could take a dead ATX unit and mod it. The next common size up for ATX units is 180mm so I adjusted the model and continued to add placeholder parts. After mocking up the two HDPLEX units, it became obvious that 180mm wasn't enough either. 200mm then? Success! Or is it? It's tempting to think this will work since the parts fit within the outline but that's an easy mistake to make. Manufacturer dimensions for video cards are notoriously unreliable so it's naive to assume the card conforms to the official dimensions in reality. Not only that, but the available space will be reduced 1-3mm in each dimension due to the thickness of the panel material. There's also manufacturing limitations like bend radius, minimum flange length, available standoff lengths, etc. that have to be taken into account. I'll go into those issues later. Plus future you that has to actually assemble this thing will curse past you who designed it if you don't include a bit of wiggle room around components for installation. The other limitation I ran into is that I did not want to permanent modify either the motherboard or video card. This is just a project I'm doing to see if it's possible and I will probably sell many of the parts eventually to recoup costs so I want to keep them in resellable condition. Problem is, the ASRock H110M-STX does not have an internal power connector, it only has a DC jack on the rear. I want to avoid having a power cord sticking out of the case and then running back inside to connect to the HDPLEX so that meant the rear IO had to be on the inside. As can be seen in the above pic though, that means there has to be enough space between the HDPLEX AC-DC unit and the board for the power connector to fit. A quick look at the available right-angle 5.5mm x 2.5mm plugs though showed that I'd need about 20-30mm of clearance. This has the advantage of allowing for longer video cards if I want to upgrade and will allow space to tuck cables and work in the case. Quick aside: It's easy to get lost in the 3D model because you can zoom in until the tiniest detail fills the screen. It's important to keep in mind the physical size of what you're designing so you don't end up in the situation of what looks like a huge gap in the model turns out to be way too small to fit your hands in so you can't easily work in the chassis without lots of cursing, sweating, and possibly gaining a few scars. For example, it looks like there's lots of wasted space in the above pic when I increase the depth to 230mm. But really that's only 30mm, typical USB plugs wouldn't even fit in the back of the motherboard without seriously bending them! Anyway, now I had to make a decision. Up until this point I wasn't sure if I would just get a custom case made from scratch or mod a dead ATX PSU for maximum sleeper PC cred. 160mm-180mm units are very common so dead ones are fairly available too. 200mm+ ATX units is typically the realm of high-end 1000W+ power supplies though, so they're much rarer and thus dead ones that I could pick up for a reasonable price are much rarer too. 230mm units are particularly uncommon too and that's the depth it was looking like I'd have to do to have room for everything. With that decision made, I needed more accurate models of the parts to better figure out the layout so I could start designing the chassis. Here's where SketchUp really shines, I've been using their Match Photo feature for years and it's awesome for this. Basically you import a picture into SketchUp, tell it where the perspective lines in the image are, and then you can model over top of it. And of particular importance for this kind of work, you can input a dimension for a known feature, and it will scale the whole model to match. Example animation with the P4SM2 here. So I used Match Photo to make models of the motherboard and P4SM2 to continue testing layouts. Here I'm experimenting with putting the AC-DC up high and the DC-ATX in the corner to maybe make room to run short extension cables from the motherboard's rear IO and the case. It was quickly becoming apparent though that any future decisions for the layout would be dependent on the specifics of the case. 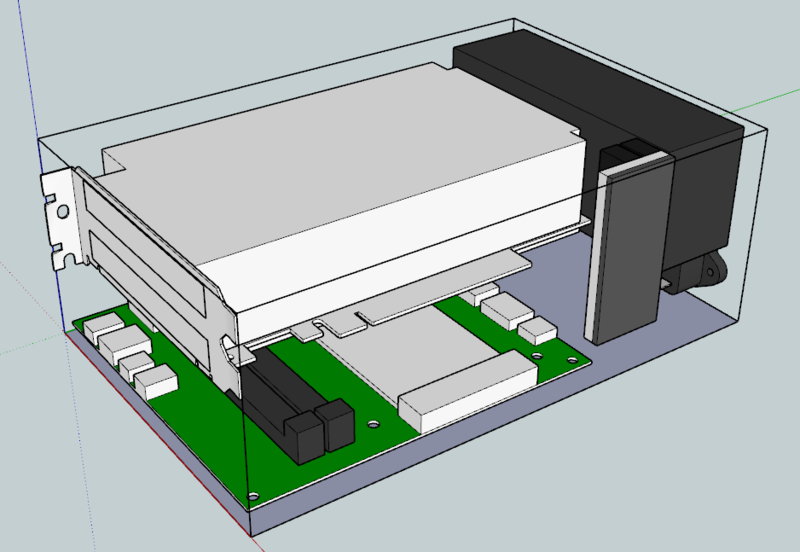 So my time with SketchUp has come to and end and in part 2 (and maybe part 3 at this rate) I'll go over some of the details of designing a sheet metal computer case. Acalanata, owliwar, Commissariat and 5 others like this. That looks like quite the puzzle when the CPU heatsink is added ! Just a suggestion, maybe you've thought about it, but you could flip the motherboard so it could ventilate from the bottom, maximizing cooler size potential, like a Scythe Big Shuriken 2 rev. B.